RHS Hampton Court Palace Flower Show has become a real challenger to Chelsea, especially for innovative, unusual and conceptual gardens. While Chelsea is spectacular, its show gardens and artisan gardens are beautiful and exquisite rather than ‘out of the box’ and its gardens always in a cycle of spring flowering. Hampton Court in early July can showcase a completely different range of summer flowering plants. This year’s RHS Hampton Court Palace Flower Show, from 1-5 July 2015 in front of the historic Tudor palace featured more than 30 gardens in five separate categories: show, historic, conceptual, summer and world, plus the accompanying majestic floral pavilion, avenues of garden products on sale and garden experts and media personalities. So if you’ve been to Chelsea before, why not plan a summer UK trip next time and arrive in London for the first week of July? Hadlow College: Green Seam. Designed by: Stuart Charles Towner and Bethany Williams. Sponsored by: Hadlow Group. RHS Hampton Court Palace Flower Show 2015. 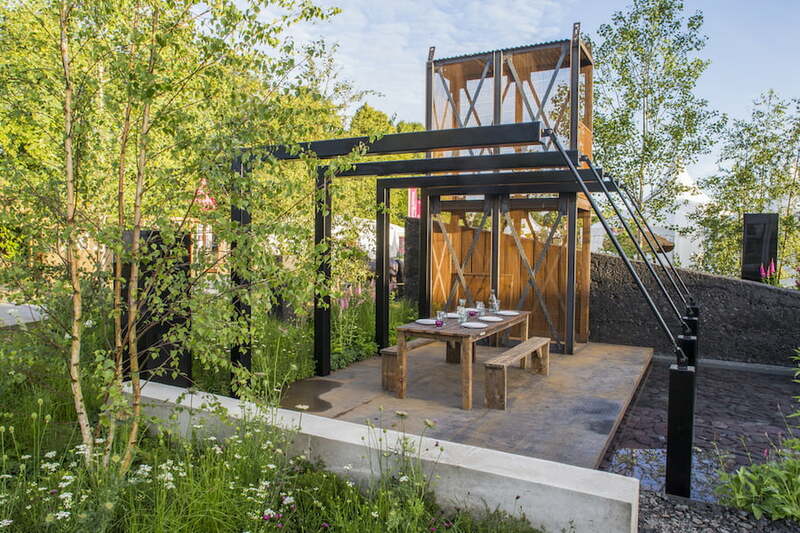 SHOW GARDENS: Winner of the Hampton Court Palace Flower Show 2015 Best Show Garden was Hadlow College’s Green Seam, with a post-industrial style pergola and mine shaft tower. Designed Stuart Charles Towner, who specialises in design and construction and Bethany Williams, an expert plantswoman, Green Seam represents the green technology revitalisation of Betteshanger, a former coalmining town in Kent that suffered economic and social setbacks following the abrupt closure of the mine in 1989. Pioneer plants colonise the surrounding spoil heaps. SABO: The Circle of Life. Designed by: Stefano Passerotti. Sponsored by: Sabo Oil, Gruppo Dei, Ecotec, Vivai Vannuccii. RHS Hampton Court Palace Flower Show 2015. Vestra Wealth: Encore A Music Lover’s Garden. Designed by: Paul Martin. Sponsored by: Vestra Wealth. RHS Hampton Court Palace Flower Show 2015. The Macmillian Legacy Garden. Designed by: Ann-Marie Powell Gardens. Sponsored by:Macmillan Cancer Support. RHS Hampton Court Palace Flower Show 2015. Just Retirement: A Garden for Every Retiree. Designed by: Tracy Foster. Sponsored by: Just Retirement Group. RHS Hampton Court Palace Flower Show 2015. The Henri Le Worm: Community Garden. Designed by: Chris Colins, Oli Blanc, Charlotte Salt. Sponsored by: Henri Le Worm Ltd. RHS Hampton Court Palace Flower Show 2015. A Growing Obsession. Designed by: Jean Wardrop & Alexandra Stevenson. Sponsored by: Yardley London LTD; Perennial – The Gardeners’ Royal Benevolent Society. RHS Hampton Court Palace Flower Show 2015. Jacksons Fencing: Secret Garden Party. Designed by: Jon Sims. Sponsored by: Jacksons Fencing. RHS Hampton Court Palace Flower Show 2015. Scotty’s Little Soldiers Garden. Designed by: Graeme Thirde. Sponsored by: Scotty’s Little Soldiers. RHS Hampton Court Palace Flower Show 2015. Squires Garden Centre: Town Garden. Designed by: Ian Hammond. Sponsored by: Squires Garden Centres. RHS Hampton Court Palace Flower Show 2015. The World Vision Garden. Designed by: John Warland. Sponsored by: World Vision. RHS Hampton Court Palace Flower Show 2015. Unique: The Rare Chromosome Disorder Garden. Designed by: Catherine Chenery and Barbara Harfleet. Sponsored by: Unique: The Rare Chromosome Disorder Support Group. RHS Hampton Court Palace Flower Show 2015. Next gallery – the Summer Gardens!